Deputy Chief of Police DI Ben Kitto, has returned to his childhood home on the Sicily Isles. After the excitement of his last posting within the London Metropolitan Police murder investigation team, he wonders how he will cope with the tranquillity of island life. Ben need not worry as a local diver Jude Trellon is found murdered; her body chained to a rock at Piper’s Hole (one of the many treacherous caves around the islands). In this beautiful but claustrophobic community, it’s hard to believe that one of their own is a murderer; as everyone knows everyone else, and though that doesn’t guarantee that they all get along - Ben knows these people well, and he can’t imagine that any of them would resort to murder. As he investigates, he finds little in the way of clues, as the seawater has eliminated any possibility of DNA. His investigation is also hampered by his boss DCI Madron, who not only appears to rule by fear and bullying, but also shows reluctance in allowing Ben to use his own initiative. With Ben’s crucial performance review in the offing, Madron is happy to use this as a form of intimidation. Ben does however find an ally in Shadow, a beautiful sleek, grey wolfhound - this isn’t a dog that he chose to adopt, on the contrary he finds him rather irritating - but Shadow was thrust upon him by an old work partner, so he just has to make the best of it - however, he will have very good reason to be thankful that he has Shadow in his life, before the conclusion of this complex, yet compelling case. Ben makes an engaging and convincing protagonist throughout, as he methodically works his way through a list of suspects. 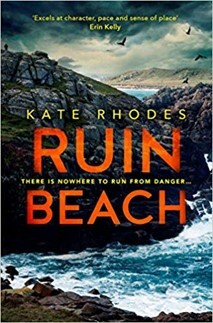 The location of the rugged, but beautiful and atmospheric Sicily Isles already makes Ruin Beach stand out, but author Kate Rhodes has lifted it to even greater heights with a narrative that makes excellent use of misdirection, propelling the reader ever onwards, and she had me guessing ‘whodunnit’ right up to its exciting and unexpected conclusion.